I’m hearing rumors that Unit 5 wants a property tax increase next year. I have to start following what they do even though I don’t have time to do it right. I’m starting here because it’s going to be fascinating to see what union members do after the Janus Supreme Court decision. 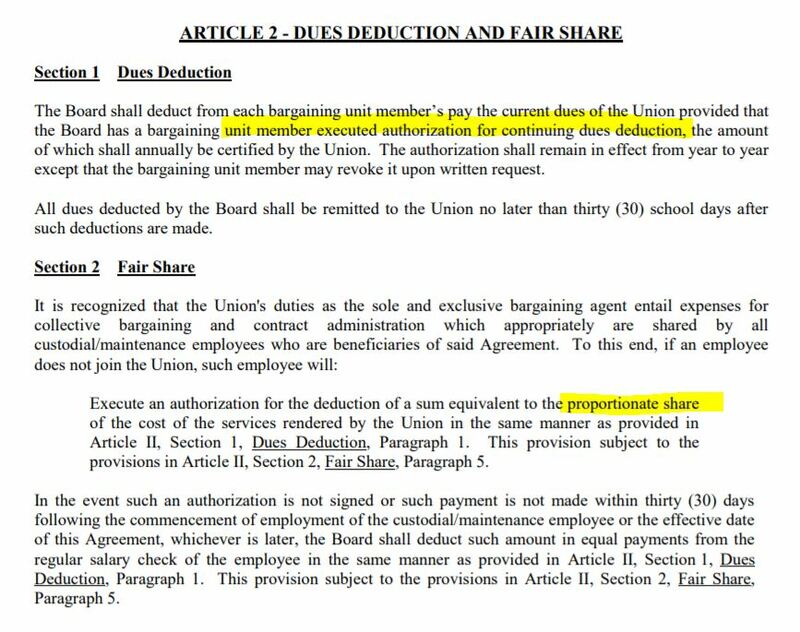 Union members can remain union members but not pay dues to the union in excess of what it costs the union to represent them. Union members don’t have to fund political activities they don’t agree with anymore. How much did Unit 5 raise salaries? For the Labor’s International Union, see PDF pages 24-25. Those pages have wage tables for the upcoming school year and the next. I couldn’t find previous contracts on the Unit 5 website, they are buried in a meeting packet somewhere. I can tell you that comparing the two years of salaries listed, every person under this contract will receive between a 3.3% and 3.4% increase next year. The wage increases for support professionals is around 2.25% between the two years covered. Taxpayers will of course be billed for the salary increases. All these union members could give themselves a raise right now by opting out of funding union political activities! I wonder how many will? Stay union members, just don’t allow the unions to force you to support their activism. School Board elections will be together with the local elections early next year. Think maybe you should be paying attention? Posted in BloNo, budgets, elections, Local, Progressives, schools, Taxes.Tagged Allen Skillicorn, IEA, Janus Supreme Court decision, Local 362, NEA, pension holiday, Unit 5, Unit 5 Support Proeffsionals. Meanwhile out Boston way, 1400 union steel workers reject a $97 per hour wage and benefits package. <<< my gawd! When teachers demand a raise, simply suggest they opt out of union dues. Unions spend a disproportionate amount of resources on protecting the worst teachers, which has historically been supplemented by the best teachers that are forced to pay in and don’t need or whine for union protection. It’s analogous to State Farm no longer insuring the best drivers, but instead only the worst drivers for whom claims would be constantly paid out.